You have a canvas, and on that canvas you have a sprite that you move around somehow. Let’s call that sprite “MovingThing”, just for the sake of this tutorial. You have one or more shapes (barriers) on your screen, and you want to know when the sprite hits them. The first thing is to represent your barrier as one or more sprites. They don’t have to move, but making them a sprite is what tells the program that it is something that might be collided with. For this tutorial, we will have a single barrier, called “Barrier”. We will also have a sprite – MovingThing – in the shape of a star. When MovingThing hits Barrier, we will change the shape of MovingThing to a blue circle. A good way to make a barrier sprite is to use an image to paint the sprite with. 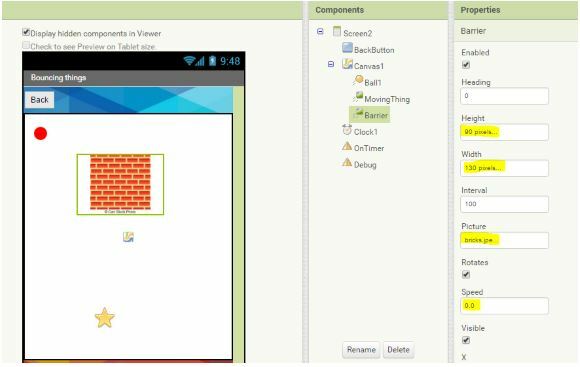 In my example, I found a picture of bricks on the internet and uploaded it to AppInventor. Set the picture to show the barrier – in this case the bricks image. Set speed to zero – otherwise your barrier will move! The star shape (MovingThing) was set by loading in another image of a star. This is just an example for this tutorial. Its speed and heading are set so that it moves upwards towards the barrier. What we want to do next is respond when the star hits the bricks. It is pretty self self explanatory. The key thing is the “when MovingThing.CollidedWith” block, which gets activated whenever the MovingThing collides with some other sprite in the scene. On responding to this event, we check that the MovingThing collided with the Barrier object, and not another object. If so, we set its shape to be a different image (called blue circle), and also stop it moving. Most of the sub-blocks are found in the list of code snippets in the MovingThing object. The “if then” block can be found in the Controls section. The green “Barrier” block attached to the purple bit can be found at the bottom of the list of blocks shown when you select the Barrier object. It turns into a blue circle. Setting the shape to a blue circle and its speed to zero are simply what I chose for demonstration. The actual action that happens when MovingThing has hit Barrier could be anything, and not do either of these things. This entry was posted in Android Dev, AppInventor, Mentoring, Mobile App Development, Schools IT, Software Development by Greg. Bookmark the permalink.